It's a wonder we've won 16. Basketball is a simple game. You dribble the ball. You pass the ball. You shoot the ball. We've got a road trip to Rhode Island. Plane leaves on Tuesday. Lighten up, Francis. There is no need, whatsoever, to creep to the edge of the building. There are no panic rooms nor panic buttons in the basketball offices at the Siegel Center. After last night's 69-61 loss to LaSalle–VCUs second gut punch in three days–the emotional thought is to make heavy adjustments because of a vague concept of "something's wrong." This is what we signed up for. Everyone knew the A10 is a better conference, played on a higher level. It was oh-so-comforting to talk about the incredible abilities of Dayton's Kevin Dillard, or the physical prowess of Bona's Demetrius Conger, within the framework of a victory. It's fun. That conversation, nor the VCU approach, needs to change when hashing out two straight losses. Tweaks? Yes. We got here for a reason and it isn't luck. Yes, I am as frustrated as everyone else that Tyreek Duren and Ramon Galloway slashed into the lane like they were the ones that painted it. The dichotomy that LaSalle entered the lane at will but stuffed VCUs drivers by switching on every ball screen is not lost. To me that was the difference in the game. And there is a part of me still sizzling about Thursday's loss to Richmond and Darien Brothers's big shot. But VCU doesn't need to blow up its plan. Rather, it's important to put a special focus on those things that go into winning–they are needed now more than ever. They are the same ideals; they simply mean more. Here's why: the A10 it better. VCU cannot get away with playing a B- or C+ game anymore. The Rams could do that last year. It took overtime at home to knock off a scuffling William & Mary team. VCU subdued UNCW on the road despite playing average, at best, basketball. That luxury does not exist this year. Duren, Dillard, the Galloways, Conger. All are physical and fast. We're not defending Tanner Milson or Derrick Thomas or Trian Illiadis anymore. Get used to this kind of game because it's coming again. There is one area of concern, and I thank a friend for hashing this out with me earlier this morning. It's the concept, and tactics, of depth. Heading into last night's game, VCU was the team that went deep into its bench, and LaSalle was 301st nationally, getting only 25% of its minutes from its bench. The theory is the Rams wear down opponents with swarming defense in both full court and half court, and eventually overwhelm its opposition. That held true for awhile. But last night the Explorers bench played more minutes (46) than VCUs (36). We essentially matched them with a 7+ man rotation. The statistics show this is a trend. We have a season average of 28.0% of our minutes from the bench, but the LaSalle number is 18%. Richmond 29.3%. St. Josph's 27%. Shaka Smart is clearly shortening the bench. And nobody should have an issue with that. The coaches are going to play the guys they believe give us the best chance of succeeding in any situation. That may be seven players, or it may be 11 players. We just have to adjust to the shorter rotation because it's new to us this year. This matters in two ways. First, opponents are used to playing with the short bench. Both St. Joseph's and LaSalle have gone with a seven-man rotation all season. They can better manage their in-game energy because that kind of fatigue is not foreign, while we are still learning. That isn't a negative thing–really it's just another in-season adjustment. The top 5-7 players need to adjust to the rigor of playing those additional minutes–managing their energy to a different standard. Second, you can see the leg-sapping physical nature of this adjustment alongside the mental concentration. Treveon Graham dropping passes, Rob Brandenberg not finishing at the rim, Darius Theus not getting all the way to the basket–we're not used to seeing those plays. The bigger issue to this adjustment, I think, is the three-point shooting. Everyone will tell you a great jumpshot starts in your legs. Without legs, shots become far more difficult to knock down, as the legs are step one in that process of shooting Troy Daniels spoke of earlier this year. After last night's 4-16 performance, that's 41-160 (25.6%) from three over the past seven games, and 29-129 (22.5%) if you throw out the Duquesne blowout. 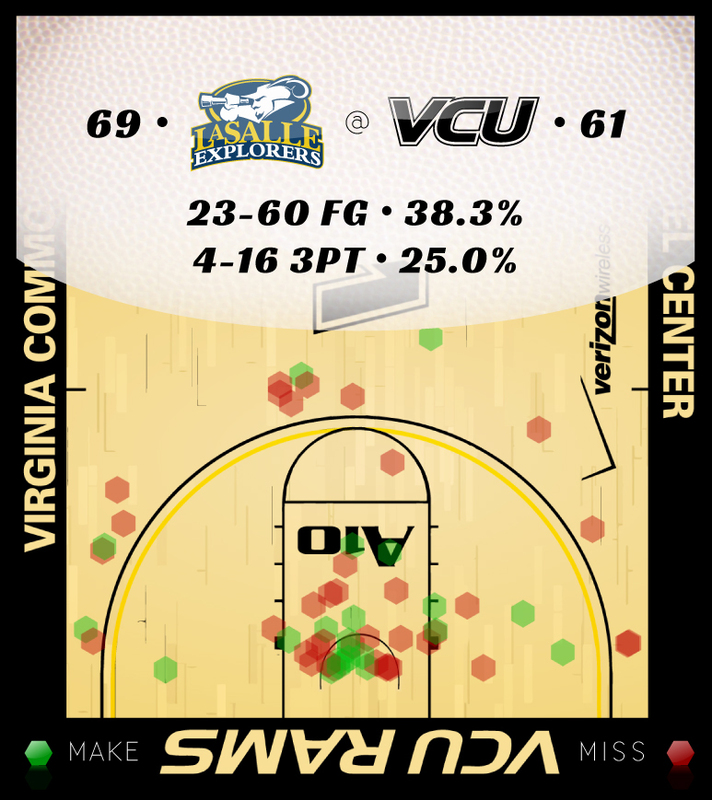 Here's a telling stat: VCU is 54.9% on two point shots–first in the A10. The Rams are connecting on 27.1% of its threes–that is 14th. (Similarly, free throw shooting 65.4%, good for 12th.) The only correlation I came muster on Sunday morning is that of not having the legs to swish from 20 feet. But I'll keep thinking. When we attack the rim with our guards or get the ball to Juvonte Reddic on the block, we see success. Similarly, that opens up the three-point line. However the lack of legs due to fatigue undermines every bit of that, and I wonder how much the shorter bench plays a role. So it isn't about wholesale changes and we don't suddenly stink. Nobody needs to rip up a play book, set a calendar on fire, or call for hilariously-misplaced changes. It's part of managing the season and it happens every season. It just stinks to lose, and that's a concept we, thankfully, are not accustomed to dealing with. There are things to work on and areas to improve and operational management of a season that's chock full of newness. That will happen, and we'll be fine. ***Juvonte Reddic. Smart said that the coaching staff spoke to Juvonte about being emotionally ready after the tough Richmond loss. I'd say 22 points and 10 rebounds–seven offensive–passes muster. Reddic's points total has increased for five straight games, and he has a double-double in three of his past four games. **Darius Theus. Yes Treveon Graham had a 13/12 double-double, but it wasn't Tre's night. Theus had six points, six assists, and zero turnovers in 35 minutes. On a night where there weren't many standout performances, Theus was solid. *The 7,693 in attendance. Cheesy? Perhaps, but a veteran writer who was making his first visit was extremely impressed at the noise level, and I was told that the LaSalle managers were on cell phones afterwards, saying "we've never played in front of a crowd like this." Well done RamNation, and we will see you Saturday.